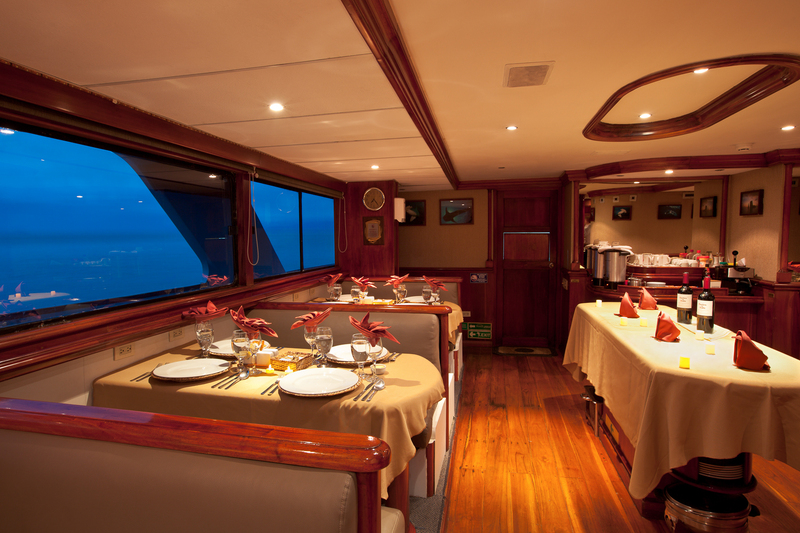 DivEncounters is the worldwide representative of the luxury live-aboard M/V Galapagos Sky (formerly the M/V Sky Dancer of the Dancer Fleet). 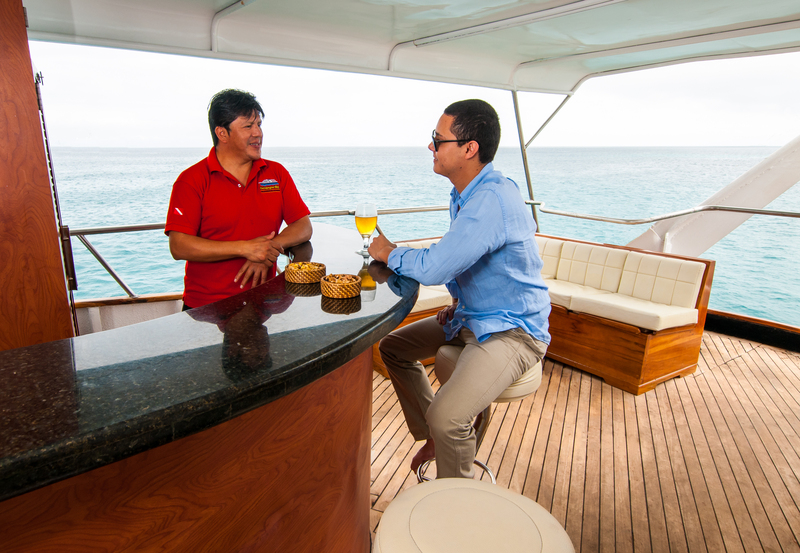 Co-founded by Peter A. Hughes and Santiago Dunn, DivEncounters’ luxury live-aboard cruises visit all of the top dive sites in the Galapagos – including Wolf and Darwin Islands on every trip. DivEncounters’ mission is to find the most exceptional underwater adventures on our planet – and deliver them to you in luxury style. 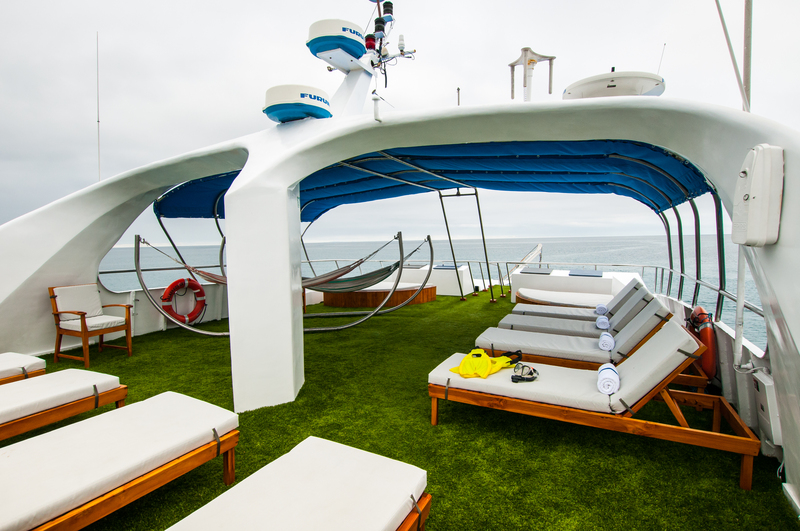 This 100 ft. (33m), 16 passenger luxury live-aboard yacht was launched in 2001 by owner Santiago Dunn. 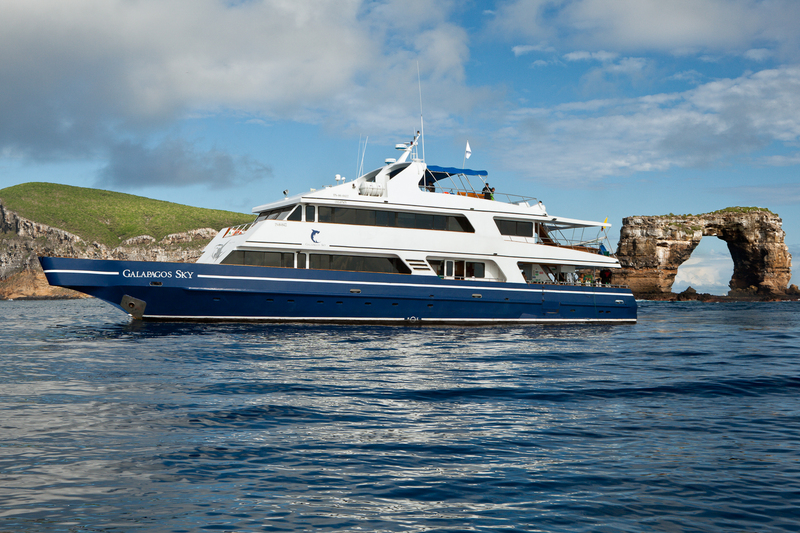 “Sky” has cruised the islands of the Galapagos Archipelago for nearly a decade – providing thousands of divers with high octane, extraordinary Galapagos diving experiences. 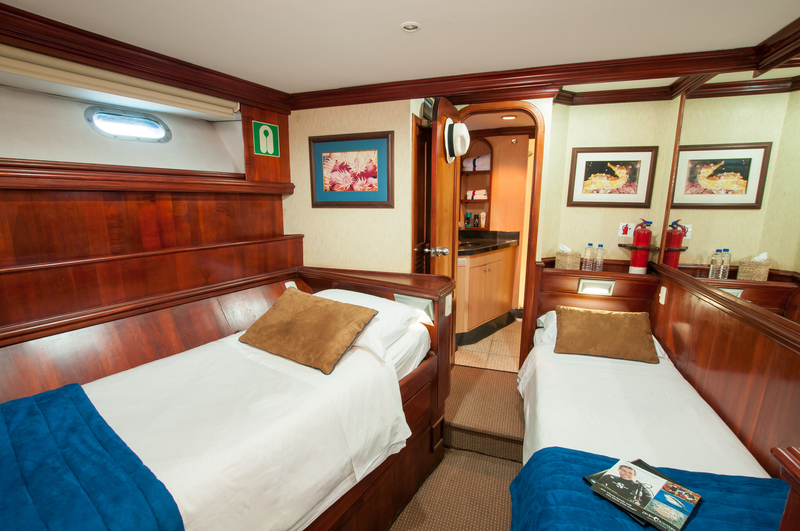 The Galapagos live-aboard cruises also offer a full line-up of luxury accommodations, excellent food, “extra touch” amenities, and a friendly, helpful staff. The Galapagos Islands are a National Park and Marine Sanctuary. Over 90 percent of the land and all of the waters are protected. You’ll be visiting a part of the world which has changed little since the time of Charles Darwin. It’s unique location at the confluence of three major currents make it one of the busiest, fishiest, and magical underwater places on earth. 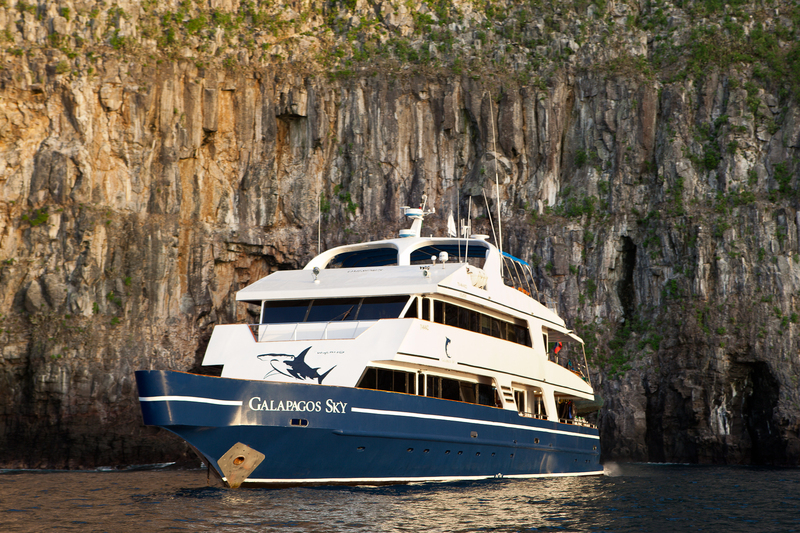 Discover the magic of Galapagos Diving on your next live-aboard cruise with DivEncounters and Galapagos Sky – see for yourself why many divers feel Galapagos is truly “the best diving” in the world. 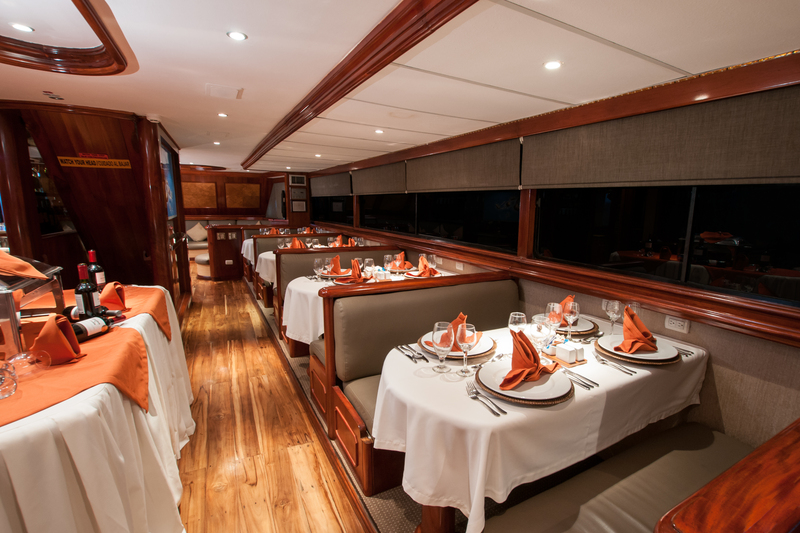 Built to exceed any/all international safety standards, M/V Galapagos Sky is not only your live-aboard dive platform to the undersea wonders of Galapagos – but also has the crew, chefs, and amenities for you to enjoy five-star service during your entire trip. 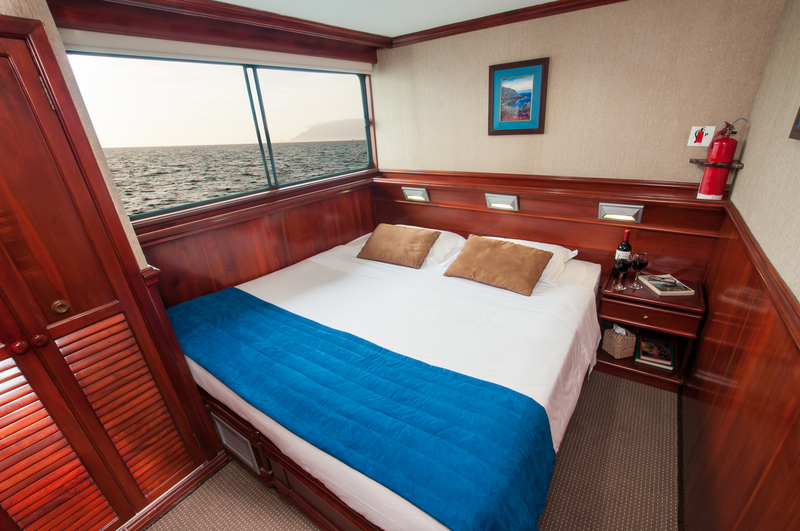 Accommodations include eight private en-suite cabins with two twin or one king size bed options. Each cabin features a private head/shower, mirrored cabinet and wardrobe, bathrobes, hairdryer, and marine safe (biodegradable) toiletries. 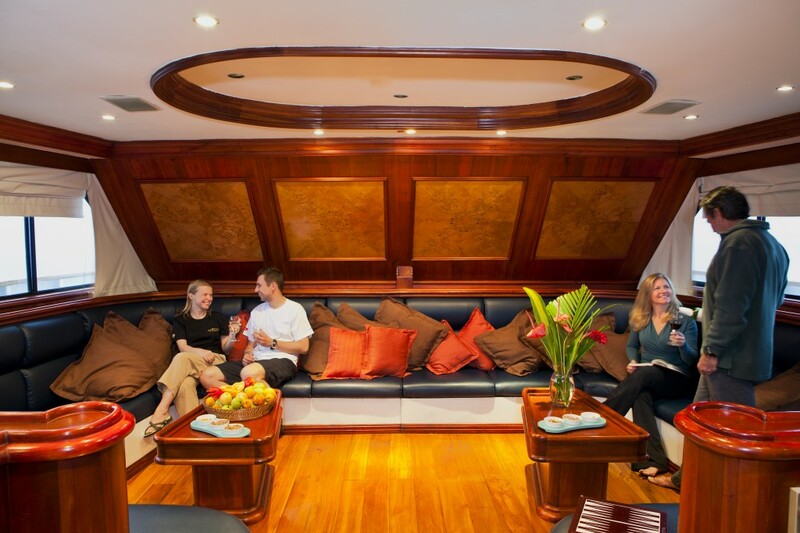 The elegant M/V Galapagos Sky is fully air conditioned and features a spacious lounge area and separate fine dining area. Two dive masters and up to four dives a day ensure that your voyage will have ample underwater time to discover the magic of Galapagos diving. The islands of Charles Darwin fame offer some of the most dramatic diving in the world. Many divers say the best. 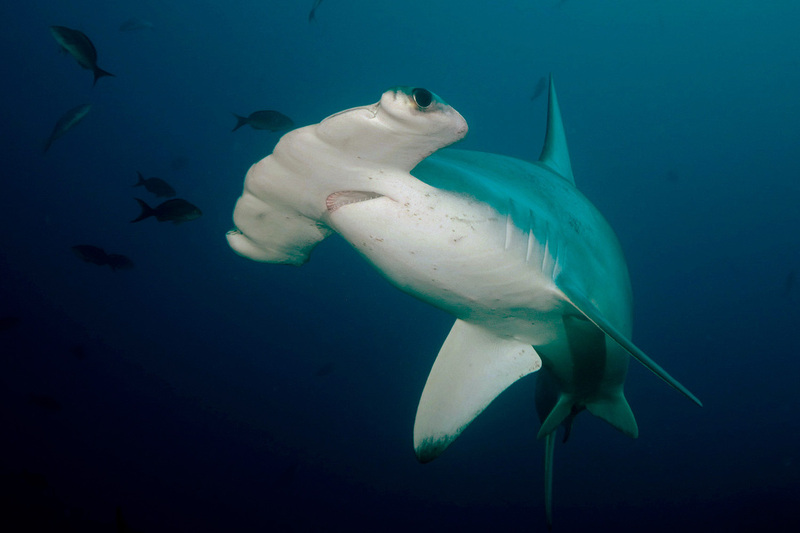 It is unquestionably the hammerhead shark capital of the world – but also home to the sleek Galapagos shark, horn sharks, white tips, silkies, and the occasional pelagic visitors like the tiger shark. That’s the beginning. Add whale sharks, giant manta rays, and graceful rays of every description (mobula, golden, spotted eagle, and marble), and you wonder if a week is enough time to see it all. 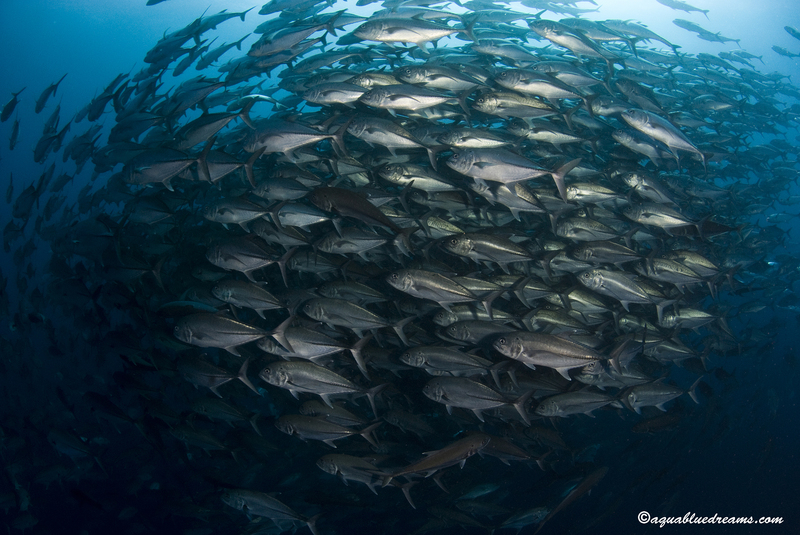 Throw in some giant schools of fish gracefully providing circular tunnels of ingress and egress in blue water – plus incredible macro marine life, and now you realize just how exciting Galapagos diving can be. 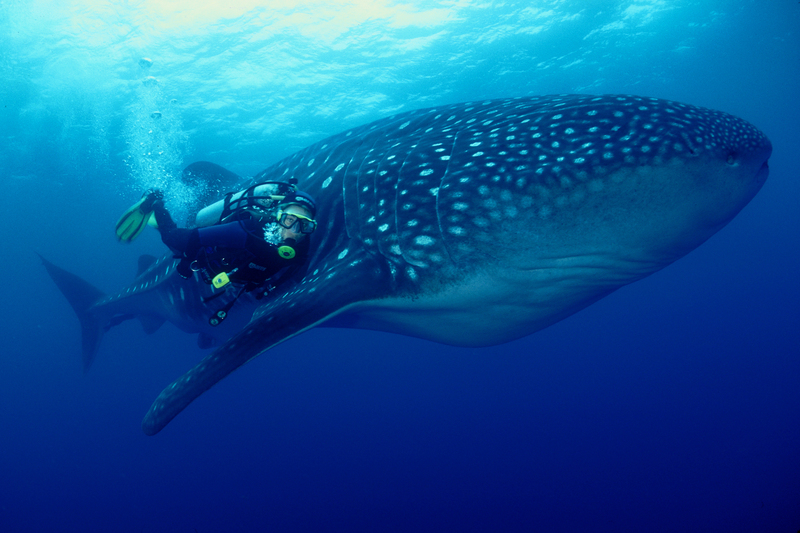 Galapagos diving is neatly divided into two seasons: Whale Shark Season (June thru November) and the slightly warmer Manta Season (December thru May). The Galapagos islands are among the most geographically remote on earth – on the equator, 605 miles from mainland Ecuador. They are pristine and largely untouched by man. 15 main islands and countless smaller ones dot the archipelago – providing plentiful shallow water habitats. Deep, oceanic water lies just offshore, and The Galapagos Islands are washed by 3 major oceanic currents (Humboldt, Cromwell, and Panama), a constant source of nutrients for the resident marine life. 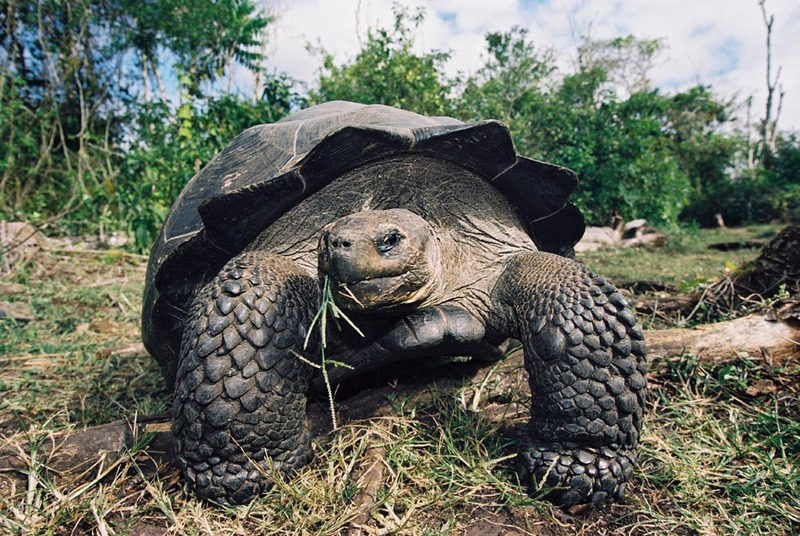 Galapagos delivers amazing biodiversity from big animals to small invertebrates. Exciting, heart pounding dive encounters with giant whale sharks immediately followed by a graceful, swooping procession of 200 schooling mobula rays. You simply never know exactly what will happen on any Galapagos dive – but experience tells us something unique and unusual will – something you’ve never seen before – and this is a big part of the magic of Galapagos diving. 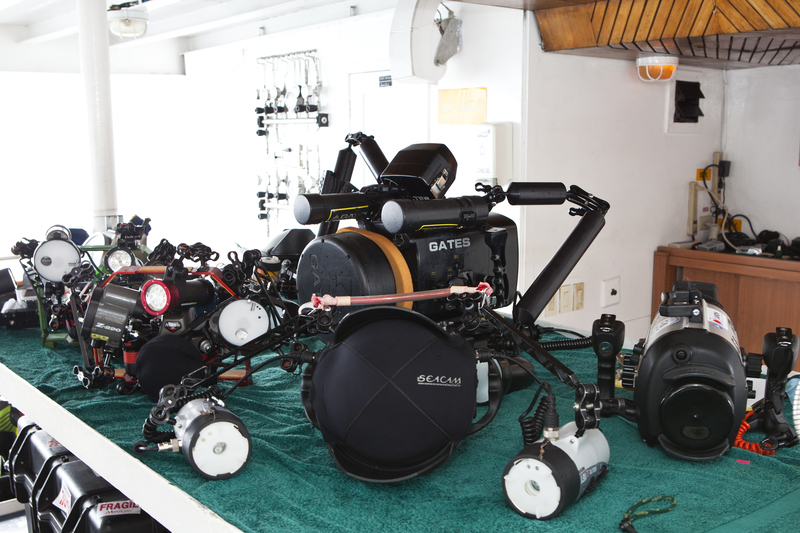 Please note that diving in the Galapagos is advanced due to strong currents, varying visibility, and cold water. Temperatures range from low 60’s to upper 70’s in different areas of the itinerary and seasons. Divers must be comfortable in these conditions, as well as have very good buoyancy and be able to do negative (sometimes rapid) back-roll entries/descents from small boats. 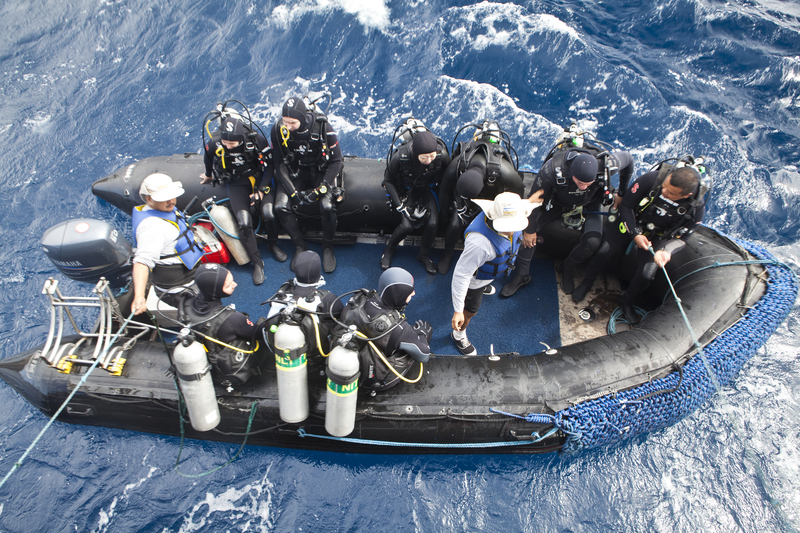 Recommended requirements include 50-100 open water dives, experience in currents, ability to remove gear in water and ability to get into small boats (inflatable tenders) in choppy seas.